What exactly does a medium do? 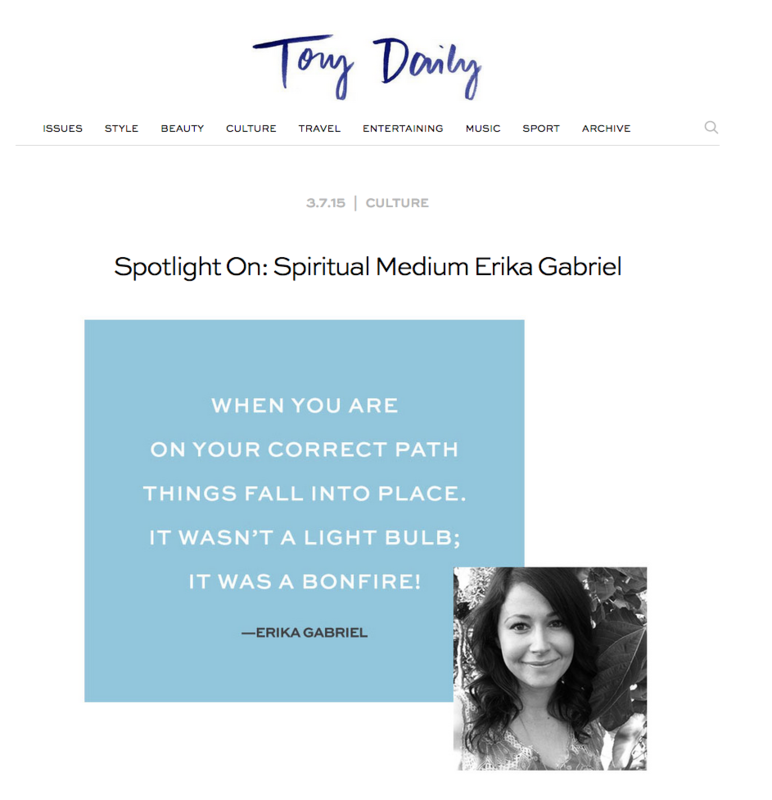 If you’ve ever wondered that, then keep reading because we speak to Pennsylvania-based Erika Gabriel, who’s made a career doing just that. 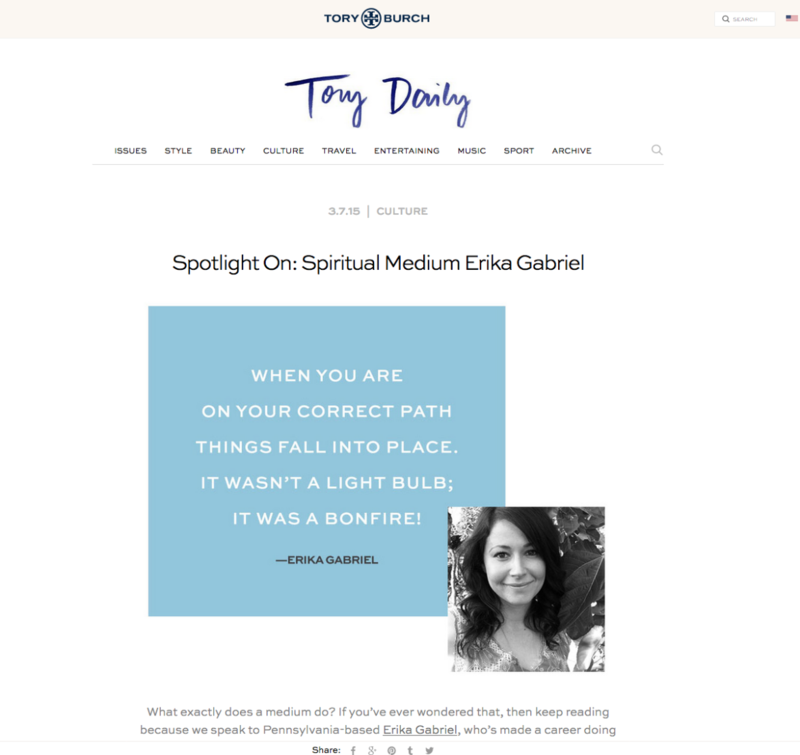 Here, she talks about how she got started on that path, and what you can do when you’re in need of a little spiritual guidance. Becoming a spiritual medium has been my life’s work and journey. I was born to do this! It was all always within me. Once I was ready to use my gift to help others people literally started showing up at my door asking for readings. When you are on your correct path things fall into place. It wasn’t a light bulb; it a bonfire! I knew that I could hear and feel spirit around me my whole life. I just didn’t quite know what that meant. The true realization that I was a spiritual medium came the weekend after I got married. I consulted with a spiritual medium who told me, “Um, you know you are a medium right?” My response was, “Oh right, of course, everything makes sense now!” All the pieces of my puzzle came together and within two weeks I was reading for other people and connecting them with their loved ones who had passed away. You can ask anything you want! If it assists you on your life’s path, your guides will answer. Whether I am reading for a teacher in Europe, a teenager in the U.S., an actress in Hollywood or someone who has just lost a loved one, the questions are very much the same. It’s an incredible experience for me as a spiritual medium seeing what connects us all as humans. Don’t expect to get lottery numbers though. Spirit stays out of gambling! Angels, guides and passed-away loved ones — each aids us in their own special way. Guides are like highly evolved friends who have usually lived many lives on earth before. They understand our human emotions and are able, like their title, to assist in guiding us in life if we ask. Angels are pure beings of light. They are our ultimate healers. They are always around us, always come when we call and we all have a guardian angel. Our loved ones who have passed away on the other side send us love and signs all of the time. If you are thinking about your loved one who passed away, chances are, they are around you. They have graduated from this phase of their soul and moved on to the other side, yet they are still with us always. There are people in every field out there who don’t have pure intentions. If you are thinking of working with a spiritual medium, listen to your inner voice, ask your guides, “Is this the right medium for me?” I am not here to try and convince anyone of my ability or that all mediums are real. What I can say is do not be afraid of your own intuition. Know that connecting with spirit is not wrong or scary but can be an awesome life-changing event. Whether you do it alone or with a medium, there is an incredible wealth of assistance and information for all of us coming from spirit all of the time. We are never alone. 1. Light a candle and breath! Set aside some alone time and clear your mind. 2. Set a clear intention of connecting with your spirit guides or main spirit guide. 3. With gratitude call to them. Start by asking a very specific, simple question. You will hear an answer. It will sound like your own inner voice. That’s OK. Your guides work with your inner voice and intuition to bring you answers. Think of it as making a phone call to your own unique support system in spirit. The connection may be a bit fuzzy at first but as you establish a deeper connection it will become very clear. Erikagabriel.com is my website and I explain things even further there. For talking with and learning more about guides, I love Sonia Choquette’s Ask Your Guides. If you are looking to connect deeper to your own self, the universe and your lives’ path, I would highly recommend any audio tape or book by Reverend Michael Bernard Beckwith. He totally changed my life.